Both the SPM and SPM-P Quick Tips are available as a printed booklet or as an online module on the WPS Online Evaluation System. In this free one-hour webinar, SPM co-author Diana Henry, MS, OTR/L, FAOTA and president of Henry Occupational Therapy Services, Inc., will share information on data-driven intervention, clinical reasoning, interpretation, and data recording using sensory-based strategies. A question and answer segment will be provided at the end of the presentation. The webinar is hosted through GoTo Meeting, and can be viewed from a computer or tablet. 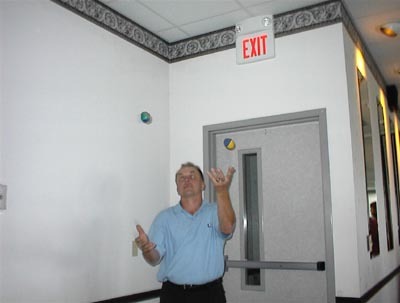 Each session can accommodate up to 24 attendees. Invite your colleagues to sign up too. Note: Instructions for accessing the webinar will be emailed 2-5 days prior to the event. Attendees will also receive a PDF version of the PowerPoint presentation used during the webinar. Case studies in schools and homes included! Click here to read a document written by an Australian Psychologist regarding the SPM! Visit the photos and feedback page for additional comments about our workshops. What makes Diana's workshops unique? WALK IN THE SHOES of those with sensory processing challenges. Diana believes that one of the best ways for individuals to understand SI and sensory processing is to first experience sensory challenges themselves. Diana has a wonderful way of using fun filled activities and 'ah ha' moments to make her point. REVISIT THE BRAIN and user friendly diagrams of the neurophysiology to help everyone understand. Those with neurology backgrounds will hear new ways of explaining sensory processing to those who may not understand including physicians, administrators, educators and parents. UPDATE YOUR KNOWLEDGE ABOUT RESEARCH including SI and sensory processing to support evidence based practice and IDEA 2004. 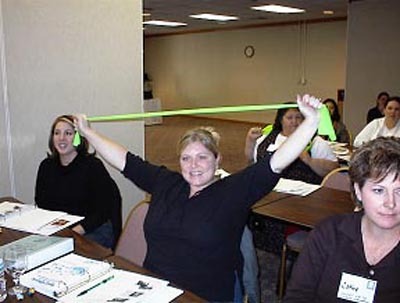 PARTICIPATE WITH MOVEMENT, music, and other sensory tools. Attendees express thankfulness for being able to have their sensory needs met throughout the workshops. USE LAB TIME to try out and learn the sensory strategies you will be able to use when you return to your homes and places of work. SIT ON BALL CHAIRS, use Bear Hugs, and more to see how they really do work. Participants enjoy and appreciate being able to try all the sensory tools Diana uses in her programs. If you have not attended one of Diana Henry's in-services or workshops, you have been missing out! Specializing in sensory integration (SI) and sensory processing for over 30 years, working in her SI clinic as well as in the schools, Diana's mission continues to be that of spreading information about SI and sensory processing world wide. Diana and her husband Rick have been traveling together since 2000 in their Ateachabout RV to bring workshops to everyone, so the entire team can contribute to developing understanding, compassion and sensory safe strategies for all. From toddlers through adolescents, each of Diana's programs brings appropriate sensory tools for each age group. Diana enjoys speaking to large groups, including school districts, universities, hospitals and clinics. Diana's Tool ChestTM handbook will be used throughout the workshop as a workbook. v Opportunities for participants to share with Diana and the attendees, the challenges that they are experiencing in their schools, homes and clinics. v Updates on research in sensory integration and sensory processing. v Experiencing what it is like to have sensory processing challenges, for attendees to better understand those diagnosed with sensory processing disorders. v Brain diagrams and case studies highlighting each of the sensory systems and motor planning. v Detective work including exposure to the Sensory Processing Measure (SPM). v The evolution of the Tool ChestTM handbook helping parents, school teams and clinicians integrate sensory processing into the home and educational settings. v User-friendly and over-the-counter activities experienced by the attendees for schools, clinics and home. v Mock classroom demonstrations with audience participation as students, teachers and therapists. v The learning of how to create 'sensory safe' spaces (Womb Space, Mother Space, Kid Power and Brain Power) in homes, schools and playgrounds through exposure to examples others have developed in their communities across the USA and internationally. Do you need some tools to address SENSORY INTEGRATION, SENSORY PROCESSING, and CHALLENGING classroom behaviors in INCLUSIVE classrooms? The Sensory Tool KitTM workshop in-services school administrators, psychologists, social workers, nurses, regular ed. teachers/special ed. teachers, OTs/PTs/SLPs, and parents. Medical and clinic based therapists are encouraged to attend with one another promoting COLLABORATION between the medical and educational communities, using SENSORY INTEGRATION. IDEA and the Occupational Therapy Practice Framework encourage teachers and therapists to address students' needs in the classroom. The Sensory Tool KitTM workshop uses a highly participatory format through mock classroom demonstrations and hands-on lab work. Participants learn to use the activities from the Tools for Students TM video/dvd and the Tool ChestTM handbook in their classrooms and homes. These are the "over-the-counter" activities that therapists have been using with parents and siblings in medical clinics. This workshop makes them available and user-friendly for all school staff and parents. Collaboration encourages detective work so that individual TOOLS assist students to address social participation, posture, motor performance, and the various levels of attention needed throughout the day. Diana Henry, occupational therapist (OT) clarifies how her profession addresses the occupation of the parent, the teacher and the student within the home and school community. She demonstrates how the tools are used to enhance the environment by making it 'sensory-safe' for students, parents and teachers. The Sensory Tool KitTM workshop updates the theories of sensory integration, sensory processing and sensory defensiveness through a user-friendly format. You will learn to identify how YOUR sensory needs as an adult, affect your occupational performance as administrator, teacher, health professional, parent and student and how to take care of them. You will be provided with the opportunity to use your body as a 'laboratory' by participating in a cardio warm up, using chair balls and Pilates based core muscle work. This workshop is designed to offer practical sensory strategies to improve the ability of toddlers and preschoolers to play and function in their various daily environments. A variety of sensory activities and environmental strategies will be highlighted using hands-on participation and videos of typical tots and those with challenges including engagement. Parents, EI specialists, administrators, preschool teachers, day care workers, therapists and other health professionals are invited to attend as a team. Dress comfortably for this fun learning experience, filled with music and movement! Topics will include everyday issues related to waking up, picky eating, teeth brushing, getting dressed, potty time, hair washing, finger nail cutting, bath time, bed time, and more. Participants will also learn strategies to help Touchy Tots, Sensitive Ears, Busy Bees, Fumbling Tots, Tippy Toe Tots, Cautious Tots, and Spirited Tots. All attendees will also receive the new Tools for Tots: Sensory Strategies for Toddlers and Preschoolers TM book, which will be used as a workbook throughout the workshop. Updates and research in sensory integration and sensory processing will be presented in user friendly terms. Explore the question "Is it behavior or is there a sensory challenge driving the behavior?" by learning about their own sensory preferences. Discover how sensations, sensory integration and sensory processing impact behavior by addressing the challenges seen with daily activities and skills specific to tots. Learn how to integrate practical sensory strategies at home, in the community and at school by using together the Tools for Tots: Sensory Strategies for Toddlers and PreschoolersTM book. Be encouraged to implement a 'systems change' including the designing of sensory safe spaces for tots in their homes and communities. Diana's SI Tools for TeensTM handbook will be used throughout the workshop as a workbook. v The Teen Brain (and why teens can make irresponsible choices). v Sleep (and why teens have a hard time waking up in the morning). v Thrill Seeking (and what recreational drugs do to the brain). v The Disconnect and Digital Kids. v Hanging Out (and how to design spaces for teens). Participants will have the opportunity to experience and learn about alternative sensory 'tools' (including the use of juggling balls and exercise band) to assist teens to participate in age appropriate activities. This workshop will include case studies related to postural control, praxis and over responsivity, using the SPM and SPM-P. In addition to addressing the clinical reasoning for developing sensory-based strategies, the mechanics and color coded sorting when using the SPM Quick Tips will be demonstrated. The SPM Quick Tips is a collection of intervention strategies that helps to answer the question "what next?" following administration of the SPM or SPM-P. (See more information on this tool at: http://www.wpspublish.com/store/p/3222/spm-and-spm-p-quick-tips-qt). The SPM Quick Tips are available as a spiral-bound printed booklet format as well as a digital version. Having this electronic interface will make it even easier to use the data from the SPM and SPM-P to customize intervention strategies for each child in multiple environments. Collaboration, data collection and promoting "sensory safe" environments across home and school environments (including the main classroom, art, music, PE, recess, cafeteria and bus) will be emphasized. Along with introducing this new digital program, the distinction between sensory-based strategies (implemented by teachers, parents and other health professionals throughout school environments, at home and in the community) and ASI (OT/SI) implemented by therapists with advanced training in sensory integration in an SI clinic will be highlighted through video clips. Diana will also facilitate hands-on movement activities using songs from the new Sensory Songs for Tots music CD to highlight sensory processing issues such as sensory seeking and challenges with motor planning. 1. Use clinical reasoning for developing sensory-based strategies following the use of the Sensory Processing Measure: SPM (5 to 12 year olds) and the Sensory Processing Measure - Preschool: SPM-P (2 to 5 year olds). 2. Learn the mechanics and color coded sorting when using the SPM Quick Tips. 3. Promote collaboration through collective empowerment between school, preschool, day care, home and clinics. 4. Implement the Quick Tips Record Form for data recording and for examining program effectiveness. Target Audience: OT, PT, SLP, Intervention Specialists, Teachers, Early Intervention Professionals, Special Education Personnel and Parents. The SPM is standardized for children ages 5 through 12 years (Kg-6th grade). The Sensory Processing Measures are invaluable in accurately assessing children's sensory processing. A comprehensive understanding of these instruments is essential to use them effectively. This one day workshop will review the research behind the development of these standardized assessment scales, the principles of their use to support the identification and treatment of sensory integration and sensory processing difficulties, and their practical application, administration and scoring. They will help participants answer the question: "Are sensory issues driving the behavior? ", and explore the SPMs' use in multiple environments, encouraging collaboration among parents, schools and clinics. Case studies will include preschool and elementary school students diagnosed with Autism, ADHD, violent behavior, as well as a student who had been expelled from a Montessori School. 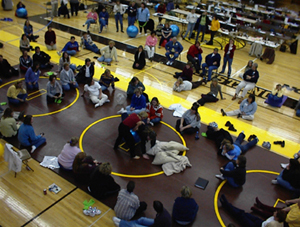 Functional issues such as potty training, sitting still during circle time and getting along with peers will be addressed as they relate to sensory-based challenges with praxis (ideation and motor planning), postural control, body awareness and modulation (over responsiveness, under responsiveness and sensory seeking). Following the use of the SPMs, a quick tips collaborative team empowerment approach will be presented for helping all those involved including the bus, playground and cafeteria personnel (when appropriate) as well as home and community to develop sensory safe environments and integrate sensory-based strategies throughout the child's day. Parents, early intervention specialists, administrators, preschool teachers, elementary school teachers, day care workers, OTs, PTs and SLPs, psychologists, and other health professionals are invited to attend as a team. Workshop attendees will receive sample copies of SPM Home and SPM School forms. The Sensory Processing Measure (SPM) is a new way of obtaining a complete picture of children's sensory functioning across different environments including home as well as in the main classroom, art, music, PE, recess, cafeteria and on the bus. It is unique as it provides the possibility of comparing performance between school and home, designed specifically for the academic, community and home teams. It is a standardized norm referenced tool with scores for five sensory systems (vestibular, proprioceptive, tactile, visual and auditory) as well as praxis (motor planning and ideation ) and social participation. Supporting the principles of Response to Intervention (RtI) and encouraging collaboration, the SPM helps answer the question "Is the behavior sensory driven?" Standardized for children ages 5 through 12. You may be interested in having us come to your school and meet with the staff as well as visit several classrooms prior to presenting a workshop for your community. Diana will incorporate sensory strategies and ideas into her workshop presentation to help you meet your school's goals.